At Brasserie Blanc we think food is all about relationships, and not just bringing people together around a table but also our relationship with the produce we use, where it comes from and how it is treated on its journey to us. So, we’re extremely proud to work so closely with our fabulous suppliers who, like us, believe that seasonal is best. On a sunny May day, we made our way to beautiful Surrey to visit family-owned Secretts farm, our rhubarb suppliers. Greeted with a warm welcome from Nigel, farm manager, we walked through the 150 acre farm as he and Clive exchanged notes on the vibrant veg and discussed the intricacies of successfully rearing rose-red rhubarb, Nigel said “we are quite selective with our varieties to try and get something with that deep red” which adds stunning colour and flavour to our dishes. 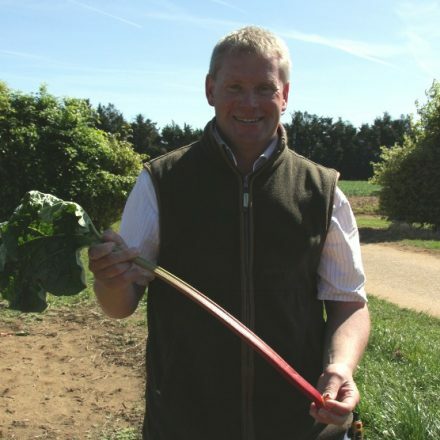 Speaking of our brilliant friendship with our rhubarb suppliers, Clive mused “we’re loving it because it’s English, we know where it’s coming from [and] we can come down and meet the growers“.